Genuine Christianity is more than a set of beliefs–it is a relationship with Jesus Christ that involves hearing His voice and following His directions. But how does one do this? What tools or spiritual disciplines enable Christians to live out their lives in dynamic submission to God’s will? Perhaps no set of principles is better suited to help Christians hear God’s voice and submit to His will than the Twelve Steps. 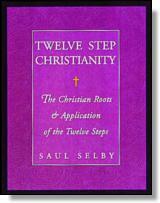 As a Christian who practices the Steps, Saul Selby knows them to be an invaluable tool for living out the Christian faith. Selby brings his knowledge to bear in Twelve Step Christianity, which teaches Christians in recovery to connect their faith with their program–and shows any Christian a clear path to a more intimate relationship with Christ. Laid out in a workbook format, with room for readers to write answers and track their progress, Twelve Step Christianity explores the roots of Twelve Step spirituality, examines the connections and distinctions between Christianity and Twelve Step programs, and offers readers a deeper and broader understanding of the myriad of powerful reasons for applying the Twelve Steps to their lives. Spirituality means that we know we are more than just the physical self. We have an energy or spirit attached to us. In some religious circles our spirit is referred to as the soul and is immortal and that the spirit was created by some divine maker or creator. On the other hand, spirituality to some is a sense of connectiveness to the spiritual nature of the universe, the collective universe that is a part of us all. What the psychologist Carl Jung referred to as the collective unconscious. The collective unconscious is the reservoir of the experiences of all humans. Some believe that spirituality is simply getting in touch with your higher consciousness because we all have the divine spirit within us and it can be accessible. Regardless of your definition, when you begin a spiritual journey, you will begin to change your perception, learn to wean yourself from societal morals, traditional thinking and the conditioning of childhood. Spirituality is not a fad or a brief moment but a way of looking at your overall environment or world view and is a lifelong pursuit. Regardless how one person defines spirituality, there are common characteristics. There is the development of love toward others, which is not defined as a true love or romantic love but a positive feeling of concern for other peoples’ welfare. Getting in touch with one’s own Deity is important for those who have a Deity. It is not necessary to believe in divine being or God to be spiritual. Many people see our spirit as divine in its own right. Therefore, communicating with your inner self will be the order of the day. Although you may not hear a clear voice, you may suddenly have a thought come to mind and as you become adept at contacting your spirit, the more answers or outcomes will take place. It’s at this time that many people contact their spirit guide, a thought or vivid dream/visualization of a person or sometimes an animal that is helpful in answering questions or steering you in the right directions. Not everyone believes in organized religion due to the fact many types of religions tend to be more dogmatic with church beliefs rather than that of studying or worshipping a creator or son of a creator. Not everyone is happy with an idea of a supreme being, but everyone can relate to the spiritual. This is the reason why many people see a distinct difference between religions and spirituality. But when we start to communicate with ourselves— our higher selves, we actually begin to understand ourselves and the world around us much better and it gives us a sense of the divine without having to describe it of define it. For members of 12-Step fellowships. “Yet we had been seeing another kind of flight, a spiritual liberation from this world, people who rose above their problems. They said God made these things possible, and we only smiled. We had seen spiritual release, but liked to tell ourselves it wasn’t true. Actually we were fooling ourselves, for deep down in every man, woman, and child, is the fundamental idea of a Higher Power. It may be obscured by calamity, by pomp, by worship of other things, but in some form or other it is there. For faith in a Power greater than ourselves, and miraculous demonstrations of that power in human lives, are facts as old as man himself. What About This Spiritual Awakening Thing? 12-step fellowship of Catholic alcoholics maintaining their sobriety through Alcoholics Anonymous. Concerned with total abstinence, spiritual development and sanctification of the whole personality of each member. Christ-centered 12-step support group for persons with any compulsive behaviors, as well as their families and friends. Uses the 12-steps of A.A. and applies them to the Scriptures. Uses Jesus Christ as “higher power.” Supplements involvement in other 12-step groups. Network of recovering alcoholic women in religious orders. Helps Roman Catholic women who are, or have been, members of religious orders and are alcoholic, or chemically dependent, compulsive eaters, compulsive gamblers, etc. For alcoholic and chemically dependent Jews, families, friends, associates, and the community. Networking, community outreach, retreats, newsletter, literature, spiritual events, and speakers bureau. Christian-oriented 12-step support group for those recovering from alcohol or chemical dependency. Information and referrals, literature, phone support, conferences, support group meetings, newsletter. Mutual support network for pastors and ministers who are recovering from addictions and actively participating in a 12-step recovery program. Provides phone network, information and referrals, and meets within other international 12-step conference. NACoA’s latest publication from The Clergy Education and Training Project® is Preventing and Addressing Alcohol and Drug Problems: A Handbook for Clergy. This was prepared with support from the Substance Abuse and Mental Health Services Administration, Center for Substance Abuse Prevention. This handbook provides some basic information on alcoholism and addiction, the impact of parental addiction on children, facts about adolescent alcohol and drug use, and prevention strategies. It also has an appendix with handouts for use with children of alcohol and drug dependent parents. NACoA, in partnership with NAADAC, The Association for Addiction Professionals, has created a new milestone for congregational leaders, a Certificate in Spiritual Caregiving to Help Addicted Persons and Families. A basic understanding of addiction as a disease is crucial in helping clergy and congregations understand the problem of alcoholism and drug dependence. Clergy can legitimize the discussion of addiction in their congregations. By breaking the “no-talk” rule that denies the existence of addiction, rabbis, priests and ministers make it safe for people to open up about addiction-related problems. They can speak about addiction as a disease and the need for God’s help in recovery. Invite guest speakers from Alcoholics Anonymous, Narcotics Anonymous, and Al-Anon to address forums, workshops, or classes in your synagogue or church. Invite a local addiction expert to lead a workshop for parents on drug use among young people. When parents begin talking to one another about this problem, they collectively become a more powerful force for prevention. Have your congregation consider providing scholarship funding to help people pay for treatment–a “recovery” scholarship. Make literature available from AA, NA, Al-Anon and treatment centers. A lack of familiarity can make clergy reluctant to tackle addiction-related problems. Attend educational workshops on addiction, such as Hazelden’s Professionals in Residence program, that can provide valuable understanding about the disease and recovery. Be assured that you don’t have to be an addiction expert to be useful. Become familiar with local resources for recovery. Visit the treatment facilities available in your area and learn more about their funding structures and criteria for admission. Attend some open AA meetings to familiarize yourself with these programs. Keep phone numbers for local AA, NA and Al-Anon sources at hand. Let your congregation know that you would like to talk with those who are currently in AA or NA about their experiences so you can better understand recovery. Prepare to receive an alcoholic or addict as you would prepare for a snowstorm — have the tools you need to deal with it readily available. When you’re talking with someone with an alcohol or drug problem, offer to go along to an open AA or NA meeting or put them in touch with an AA or NA member who can accompany them. Ask individuals to go for an assessment of chemical dependency. This is an easier commitment to make than going for treatment, and many treatment facilities offer short assessment programs. “It’s very important for clergy to recognize that a family can get help, whether or not the alcoholic seeks help,” Mac Dougall pointed out. Al-Anon is a Twelve Step mutual-help program for family members and friends of alcoholics. In conversations with families, explain to them that addiction is a disease and talk about recovery for the whole family. Many treatment facilities have family programs that provide education and healing for family members, whether or not the addicted individual seeks treatment. Alive & Free is a health column that offers information needed to help prevent substance abuse problems and address such problems. It is provided by Hazelden, based in Center City, Minn, USA. The ability to derive pleasure from the world and oneself is a uniquely human characteristic – one so ethereal that describing the pleasure at hand fails to evoke the same delight in the listener. Just try going through life without being able to experience beauty and pleasure first-hand and you’ll get a glimpse of what life can be like for many a drug addict, says Dr. Roy Mathew, director of the Duke Alcoholism and Addictions Program. Many former addicts describe themselves to Mathew as having been incomplete, lacking in a fundamental quality they knew could make them feel whole. Drugs, they say, replaced the pleasure they failed to derive from life — if only temporarily. It is Mathew’s goal to teach addicts how to experience real pleasure in life, the kind that imparts sustained, long-term fulfillment: the giddiness of new love, the warmth of cuddling your baby, the satisfaction of a job well done. Without that ability, he says, even the high of heroin or cocaine cannot impart the sense of spiritual fulfillment one derives from truly satisfying experiences. “Addicts don’t find long-term happiness in drugs,” Mathew says. “Addiction is often the only pleasure they’ve known. But once you have experienced real pleasure, the lesser pleasures derived from drugs lose their appeal.” It’s an approach long embraced by recovery groups like Alcoholics Anonymous, where spiritual pursuits are encouraged as a way to replace the artificial and fleeting euphoria of alcohol or drugs. And while he applauds its merits, Mathew is not content to dispense spirituality without understanding the mechanisms that underlie its therapeutic effects. Drug Research Provides CluesFinding answers is more of a journey than a destination, he admits. But along the way, he has gained some valuable insights into how the brain works. By imaging the brain as it responds to various experiences and chemicals, Mathew has found that drugs like marijuana stimulate the very same pleasure centers in the brain that are stimulated by spiritual experiences, such as beautiful music or scenery. Marijuana, for example, increases blood flow in the brain, where emotions are turned into conscious thought. It is in a particular region where feelings of altered consciousness and unconectedness arise – experiences common to both drug users and those who experience a spiritual experience. In the brain, marijuana acts to alter perception of time and space. Such advances are admittedly gradual, but Mathew is hoping they’ll eventually shed light on a field whose only hard data is that which the drug user describes. “Knowing where the pleasure centers are, and how to invoke them to respond, could give us the answers we need to understand their craving for drugs,” Mathew says. It is far more complex than targeting a faulty gene or neurotransmitter, he believes. Genes are only part of the human equation, in which physical, chemical and behavioral elements converge to create the unique perception of self. When the self is incomplete — as so many addicts describe — you can’t make it whole by giving quick-fix remedies, Mathew says. For example, giving methadone to a heroin addict inhibits the user’s craving for that particular drug but fails to address his inherent need for pleasure and fulfillment. With nothing to replace the addict’s thirst for pleasure, the person is likely to continue seeking socially inappropriate means of pleasure, whether through drugs, gambling, sexual promiscuity or other behaviors. Drugs Without AddictionBut what about the individual who uses drugs to enhance an already pleasurable state without succumbing to destructive behaviors associated with addiction? Such is one of the many questions that plague Mathew about the brain’s response to drugs and how the brain experiences the pleasure sensation. “Fifty percent of drug users do so because they have a mental disorder like anxiety or depression. The other 50 percent use them because they simply like to – because it feels good,” Mathew says. “Does that mean their baseline personality is deficient in some way? Or does it mean that person is unusually inquisitive about other mood states?” Mathew theorizes the difference may be in the user’s ability to evoke a spiritual response from within, independent of drug use. Even though a starlit sky can bring about a spiritual sense of awe and wonder, the brain should be able to experience pleasure independent of external cues, independent of the five senses and the information they bring. For decades, recovering alcoholics and those who treat them have incorporated spirituality into the recovery process — whether or not it’s religious in nature. But few research studies have documented if and how spirituality changes during recovery, nor how those changes might influence a person’s chance of succeeding in the quest for sobriety. At the beginning of the study, and again six months later, the researchers assessed 10 different measures of the participants’ spirituality and religiousness using standard research questionnaires. These included their views of God, religious practices such as prayer or church attendance, forgiveness, spiritual experiences, using religion or spirituality to cope, and existential meaning. The researchers also assessed participants’ alcohol use, and problems related to their alcohol use, before the study began and after six months. All of these responses were combined with information about gender and AA participation, and analyzed using statistical techniques. In all, the study shows, half of the measures of spirituality changed significantly in the six month period, including daily spiritual experiences, the use of religious practices, forgiveness, positive use of religion for coping, and feelings of purpose in life. But the measures that assessed individuals’ core beliefs and values about God or religion didn’t change. At the same time, use of alcohol decreased significantly, and 72 percent of participants did not relapse to heavy drinking. Robinson and her colleagues write that their results suggest that “proactive and experiential” dimensions of spirituality, rather than cognitive ones, were contributing to the recovery and decrease in drinking in the first six months. In other words, changes in core beliefs and values don’t have to occur in order for someone to be more open to spiritual experiences or to take part in more spiritual activities. Each individual’s own spirituality, and the ability to experience growth in that spirituality, appears to be paramount, the authors suggest. So, each individual alcoholic might do best by searching for a recovery program that best matches his or her existing belief system. Some alcoholics may derive help from the spiritual aspects of AA, but others may not, says Robinson. “There’s more than one way to feed your spiritual self,” she notes. The U-M research team has begun a new phase of research involving people who are taking part in three different alcohol treatment programs, and alcoholics not currently in treatment. This study will follow more than 360 people over three years. They are also analyzing the data from this 154-person group more in-depth, including looking at how the individuals defined and described their own religious and spiritual preferences and practices. The study was funded by the Fetzer Institute, which sponsored the initial workshop on spirituality and alcoholism that led to the current study, and by the National Institute on Alcohol Abuse and Alcoholism. In addition to Robinson, the study’s authors are Kirk Brower, M.D., an associate professor of psychiatry and executive director of U-M Addiction Treatment Services; James Cranford, Ph.D., of UMARC and the U-M Substance Abuse Research Center; and Jon Webb, Ph.D., formerly of UMARC and now of East Tennessee State University. Reference: Journal of Studies on Alcohol and Drugs (formerly the Journal of Studies on Alcohol), March 2007, Vo. 68, No. 2, pp. 282-290.